Converting a magazine, catalog, or other publication into an iPad app can be as simple as allowing InDesign to export a .folio document for you—more on that later. But to create a compelling app, you'll want to add some interactivity. InDesign clusters all the tools you need for creating interactive content into one new panel called the Overlay Creator. After selecting a frame on your InDesign page, you choose the kind of overlay you want to apply to that frame, and then set its options. For example, if you create an image sequence from multiple images, you can set it to play automatically at a certain speed or allow users to flip through the images manually by swiping on the frame. The Overlay Creator lets you hyperlink to another location in the document, combine a series of images into a slideshow, add audio and video files, create a 3D panorama from six images, add Web content from either a URL or a folder containing a website, or allow the user to pan and zoom around a cropped image. The Pan & Zoom feature is particularly helpful and easy to use. It lets the designer reduce the size of an image or crop it to a small portion of its original view. This lets the reader zoom in to see details or pan to see areas that were cropped. All your Interactivity is added through the Overlay Creator panel. Each kind of Overlay has its own options. Adobe's servers generate and manage all the Folios (for now, iPad apps) you create. You can generate and share one Folio (publication) for free, using your account at Acrobat.com. If you pay for additional workspaces at Acrobat.com, and you have an Adobe Digital Publishing Suite account, you can generate and share additional Folios. Your purchase of an Adobe Digital Publishing Suite account also lets you distribute and analyze digital documents published on a tablet device—for a fairly hefty fee. While previous versions of InDesign could export a document in ePub format, the process required significant post-processing outside of InDesign. This new version includes tools to simplify the process. For example, you can now set an image to resize automatically when a page is resized by an e-book reader or Web browser, which keeps the image in proper proportion to the text. You can now export graphics, images, or text frames at up to 300 ppi, a vast improvement over the previous limit of 72 ppi. You can also export audio and video content to HTML 5 format, as well as to ePub 3.0. 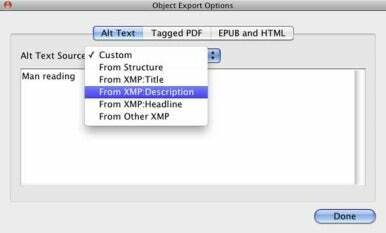 InDesign also now provides helpful controls when exporting to ePub format, such as whether to order content based on the page layout, the XML structure, or the Articles panel. 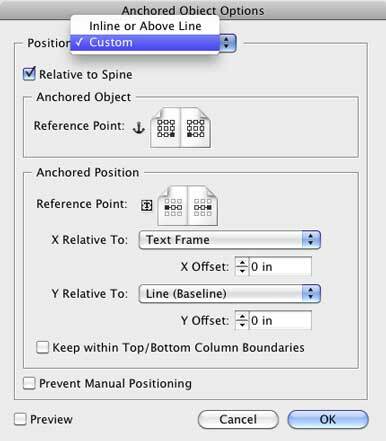 You can select a paragraph style to use for page breaks, include headers and footers in InDesign tables, display footnotes after a paragraph instead of converting them to endnotes, convert numbered or bulleted lists to ordered and unordered lists, and remove all soft returns used in the InDesign document upon export. After exporting, you can view your ePub in iTunes. The Object Export Options have been improved for electronic documents. Most designers use Styles to maintain consistent text formatting across a document. Now, you can map those Styles to XML or HTML tags so that eBook readers and Web browsers know when a paragraph is a headline, subhead, body text, caption, and so on. Character Styles can be mapped to character-based tags. You can also enter a CSS class, if you’ve defined them for your document. InDesign's interface for creating Anchored Objects is vastly improved in CS5.5, allowing you to simply drag and drop an object or group of objects directly into the text in a frame. Actually, you drag a little blue square on the object or group. Depending on the modifier keys you hold down when dragging, the object can become either inline or anchored. Inline objects remain within the text column, while anchored objects can be positioned outside the text frame—both will move along with the text as it flows. You can now anchor objects much more easily. An option in the Links panel does let InDesign update links while saving the document, but you must enable this option separately for each linked box. Also, this is a one-way process: you can't update the Parent with changes made to the Child—you always have to make changes to the Parent. And you can't separate text from styling—the formatting of the text in every box must remain identical or you lose the ability to synchronize the changes from the Parent box. I would like to see this feature implemented with the level of control provided in QuarkXPress 9, where you can choose to synchronize the text, the formatting, the frame properties, or any combination, and be able to make changes to any of the frames and have those changes ripple out to all the frames. Preparing a document to meet Web Content Accessibility Guidelines 2.0 or Section 508 standards requires adding alt text to images and tags to paragraphs. 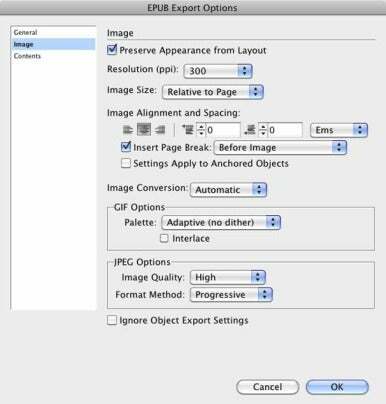 InDesign now lets you add alt text to each image in the document, from within the Object Export Options dialog. To save you some typing, if alt text has already been added to the metadata for an image in Adobe Bridge, Microsoft Word, or another application that writes XML metadata, that alt text will be available in the Object Export Options dialog as well. Adding alt text to images is much easier now. If you've used the Articles panel to assign a reading order to the document, that order can be passed along to the accessible PDF. To assign PDF tags to paragraphs of text (for headlines, body copy, and so forth), you can now use the Paragraph Styles Options dialog described in the Map Styles to Tags section above. If you're still using InDesign CS4 or earlier, this is a great time to upgrade. If you're using InDesign CS5, you'll definitely want to upgrade in order to produce electronic publications such as ePubs, iPad apps, or accessible PDFs. Just be aware that Adobe is now on a one-year paid upgrade cycle, so you'll be paying again in a year. Note: With the release of Lion, Adobe posted a tech note outlining some of the issues users may encounter with some of its Creative Suite applications. InDesign was mentioned only peripherally in this document. However, be sure to check the tech note on Adobe's website for updated information on how Adobe products interact with Lion.